"Meet the Hill family and a rodeo queen"
The latest in the enjoyable Hills of Texas western romance series introduces Rusty Walker, who has worked hard to please her ranching father all her twenty-five years. Seems that's not far enough for a controlling man, even after his death he wants to dictate his daughter's life. RESISTING THE RANCHER might lose her everything. Williams Hill has driven up from Texas to provide rodeo stock for a town in the Colorado Rockies. Another outfit is providing most of the stock but he has brought up some powerful bulls. He notices his sister-in-law's Quarter Horse, a red bay called Mischief Maker, being ridden by a new trainer for barrel riding, performing superbly. He goes to talk to the rider, Rusty Walker, but she's not interested in talking to appreciative cowboys. Her dad runs the local rodeo stock ranch, and he doesn't like her chatting with competitors. A misunderstanding occurs and Rusty gives Will a thank-you kiss for helping her, before discovering that he's trying to talk her dad into a partnership. Now she feels he was using her. Wow, the story heats up in tensions of all sorts, as Rusty's dad confides in her that he only has a few months to live, and she has to marry someone he approves of or lose the ranch. He's always resented just having a female heir. Rather than meekly play along, her anger and independence drive her to leave. Maybe she'll take up a horse training job in Texas... even if that means working with Will. I really enjoyed reading about Rusty's competitions. She puts her horse first and is friendly with other competing women. She's also a dedicated trainer, with a punishing schedule like all real horse people, and a strong businesswoman. In a small act of rebellion she wears pink clothes at times, which her dad dislikes. Will has his own quirks, such as wearing amusing t-shirts, which help him come across as an individual. Sometimes it's hard to imagine a cowboy having a normal sense of humor. He also has manners, as his mama raised him right. But is there any etiquette that covers a drastic situation like Rusty's? Maybe there is in Texas. As this is part of a series about the Hill family, we get conversations about siblings and marriages, degree-takers and ranchers. Then we get to meet most of the characters described, just as would occur in real life when people get into a relationship. I'm going to look out for the first book by Kadie Scott, called SAVING THE SHERIFF. 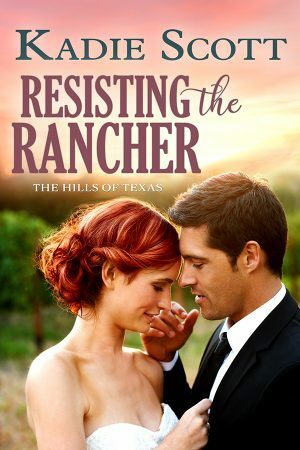 RESISTING THE RANCHER is an adult romance, and the Hills seem like darned fine people.